Ultra cool mid-1950s Lord Elgin. This is a Lord Elgin Model 4638, commonly known as the “Millbrook.” This example dates to 1954 and is in Very Good condition. The Millbrook, with its sharply angled lugs and its unusual numerals, is one of the more distinctive Elgin designs of the early 1950s, and has rightfully become a favorite with collectors. This example is in Very Good to Excellent condition. 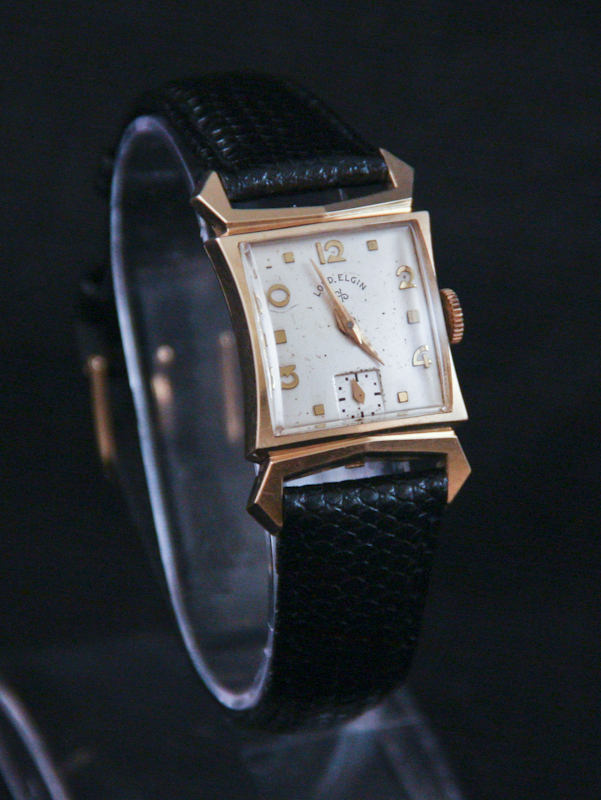 The case is signed Elgin and is made by the Star Watch Case Company; it is 14K yellow gold filled, bezel and back. The case is in Excellent condition. It’s hard to find examples of this model in good shape as the sharp angles of the lugs tend to wear. This watch shows no brassing and no wear through. The dial does show its age somewhat, with a bit of spotting. The applied gold numerals and markers are in Excellent condition, as are the hands. The crystal is a new old stock replacement. This watch is powered by Elgin’s 21 jewel 670 movement. It is running well and keeping good time. We’ve added to this watch a very nice, unused, vintage leather band (this is actually a Wittnaeur band, but it looks great with this watch!). Note that this watch has not been serviced while in our possession and we do not know the service history of this piece. While it is running well and keeping good time now we do advise all vintage watch owners to have their watches regularly serviced to assure the longest enjoyment.